I'm stepping away from beauty for a moment today to talk about something that happened in my life recently. My beautiful grandmother passed away on January 2 at the age of 88. I gave a eulogy at her funeral, and I'm including it here -- because it really does say everything I've been thinking and feeling since it happened. I hope you'll get a sense of the wonderful woman she was through the words and photos below. 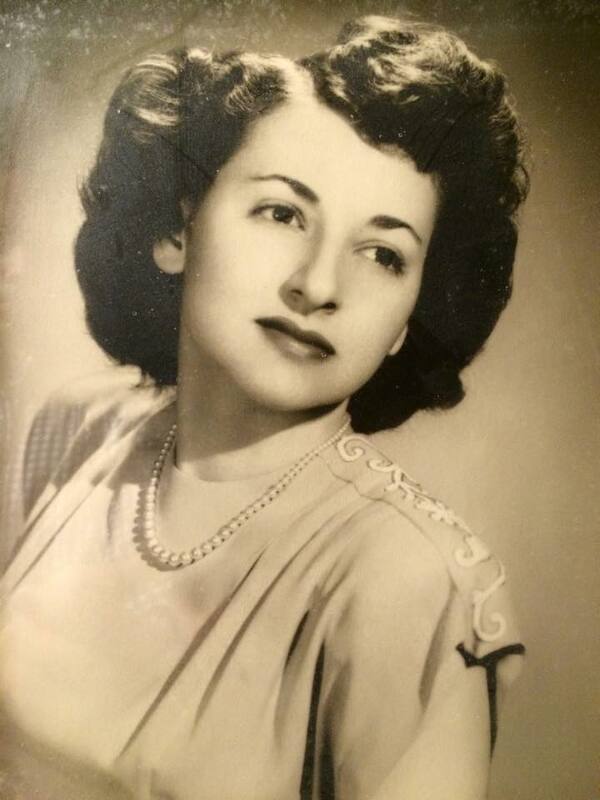 My beautiful grandmother, Estelle Meshenberg, circa 1946/1947. I always thought she looked just like Donna Reed. Evan and I always called our grandma “Bubby.” And to be honest, I don’t really know how that name for her came to be. It’s just who she always was. But I think it fits. It really does accurately depict her loving, caring nature. As I’ve gotten older, I’ve come to realize that many of my traits and characteristics come straight from Bubby. For starters, neither of us were blessed in the height department. (Okay, no one in our family really was, but Bubby and I were always the shortest.) Bubby also had perfect, smooth skin for her entire life. And now that I’m in my 30s, I’m definitely hoping I continue to take after her there. But these traits go deeper than the surface. Bubby loved the scent of flowers, especially roses and lilacs. I don’t think it’s any coincidence that those are my two favorite flowers, too. Her jewelry box was always overflowing with beautiful necklaces, bracelets and earrings, all of which she let me play with whenever I wanted -- and, again, I don’t think it’s a coincidence that I’ve created quite the jewelry collection in my adult life. Bubby LOVED to entertain. We went to her house every Friday for Shabbat dinner growing up, in addition to multiple other times throughout the week. Our aunts, uncles and cousins were almost always present, frequently in addition to friends Bubby had known for decades. This is another trait I’ve inherited -- I love having friends and family over and bringing them all together. Lighting the Sabbath candles with my grandfather and my grandmother's brother, Art, looking on. 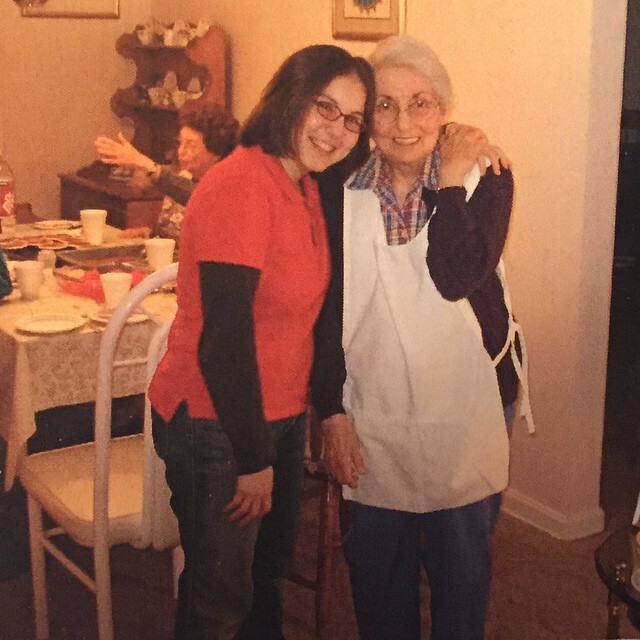 She was the absolute best cook and baker, with so many of her dishes becoming legendary in our family. Her roast chicken and potatoes, her brisket (which we actually called roast), her goulash, her chocolate cake, and especially her apple squares -- which I immortalized in a 6th grade essay about my all-time favorite dessert -- gave our family such joy (and probably a few extra pounds). The love I spoke of earlier? Certainly present in Bubby’s willingness to cook different dishes for one Friday night so that everyone would be happy and eat what they wanted. All I had to do was mention once that I liked mandarin oranges, and then she bought them in bulk just so I could have my own can to put on my salads. Bubby would start making matzah balls for us in January, which she claimed she did so she could practice until they were absolutely perfect for Passover. And, okay, I definitely haven’t inherited her talent or love for cooking, since I’ve mastered the art of ordering in, but I do happen to make really good matzah balls. The trait I’m happiest I inherited, though, is Bubby’s love of taking photos. I honestly can’t remember a time when I didn’t see a camera either in Bubby’s hand, on the table next to her or around her neck. She was always waiting for the next picture taking opportunity to strike. Because of this, Evan and I are extremely fortunate to have a very detailed depiction of our childhood. There is certainly no dearth of photos to be had in the Meshenberg and Sanders families thanks to Bubby’s constant snapping (sometimes when we had her delicious food in our mouths, of course). My friends are always so impressed by the hundreds of photos I’ve collected from my entire childhood -- and this is all Bubby’s doing. I have definitely become the person with both family and friends who now always says, “Let’s take a photo!” I love to capture and immortalize memories and moments just like she did. We actually captured my grandmother capturing a photo! We were so meta for the 1990s. My life would not be what it is without the strong presence and influence of my Bubby. I feel so fortunate that I had so many years with her. She was truly an eshet chayil -- a woman of valor -- and I will love and cherish her memory always. Thank you so much, Krystal. Jamie, I am so sorry for your loss. Your grandmother must have been a wonderful woman. Your photos make me think about Shabbat and holiday dinners at my "nana's" house, and we just celebrated her yahrzeit. I'm glad you have a lifetime of great memories. Allison, thank you so much for your kind words. Shabbat dinners with family are so special, aren't they? My condolences and thoughts to you as well during the time of your nana's yahrzeit. So sorry for your loss. Your grandmother sounds absolutely wonderful. Your eulogy is absolutely beautiful and filled with such wonderful memories. Thank you very much, Brianna. I really appreciate your kind words. I'm so sorry for your loss. You're grandmother sounds like an amazing woman; thanks for sharing this post with us. Thank you very much, Kristin! I'm so sorry for your loss, that's a bad news, but your grandmother sounds great. Awww, Kath! Thank you so much -- you're so sweet. Grandmas really are the best. Sending you a hug right back! So sorry for your loss. Your grandma sounds like an amazing woman. Thank you very much, Bailey. Jamie, I'm so sorry to hear about the loss of your Bubby. Thank you so much, Jennifer. Thank you so much! Grandmas really are wonderful. Sending you a hug! What a lovely tribute to your grandmother! What a remarkable woman! I am so sorry for your loss! Thank you very much, Lola! I really appreciate it.